Alamelu alias Jayalakshmi. Sometime if we wanted to make fun of her, we'd call her Boguloor Jayam. A lady who hadn't gone to school past 4th standard. Or maybe 3rd. I am not too sure right now. Someone who wasn't a great cook at all. Yet, I loved her watery sambars. It was a standard joke in our family - when we'd remark that the rasam wasn't good that day (or any dish for that matter), pat came her response "Yaen dee... nannaa dhaane di panninaen"? As if something had magically gone wrong between the time she had finished cooking and brought it to the dining table. My Paati. I hadn't seen her with teeth at all. I remember her toothless, baby-like grins. And when anyone in the family came home angry, upset, or anything on those lines, her standard response would be "saadhatha kalandhu vaaila adaicha seriya poidum". Feed the anger. Feed the sadness. Basically feed and there shall be happiness. I remember the time we all sat around her in a semi circle and she would give food on our hands. It required very special talent to have rasam saadham that way. She was married to my very suave, english speaking, regal-in-bearing sort of a man in my grandfather when she was 10 or 12. Theirs was a mismatch in every way. But their marriage lasted their entire lifetime. My grandfather died at 92. Until then he'd keep calling out to her "Adiyaaaayyyyy" and she'll respond, "varennaaaaaaa". She was as tired or old as he was. But unlike any of the women of her generation or her age, she didn't wish to die a sumangali. She always said no one would be able to cope with the demands of thatha other than her. "I'd rather die after him", she'd say. I think she probably had a true vacation in life only after he passed on. I could never talk to her much after thatha's demise as she was sent soon after to my uncle, having harbored the wish very typical of her generation - to die in her son's hands. My greatest regret was none of us were allowed to see her for the last time. Each family has their share of quirky members. It was a different story that I had never known my mama. He was always referred to. I never got to really see him until my grandfather died. And he didn't inform any of us when paaati died. Several things in life can never be explained. While growing up, when mom was struggling at several levels for several things, my paati was my mother. Mom used to say that I used to refer to paati as amma and mom as "Padmasini". And to this day, I can never figure out how she managed with a child who spoke only marathi. I cannot figure out how she took me to school and brought me back in a city like Bombay. I remember one day, she excitedly told me that she now reads Chemistry and Biology. I was like what??!!!!! And I asked her how, because she spoke no English. The one thing she could manage was "see dooooooun". This was her version of "sit down" if she tried to show off her skills to a visitor and then follow it up with a pretty proud smile. I tried to teach her the a b c d-s when she was in her 70s perhaps. So, when her announcement came to me about Chemistry and biology I was curious to know how she suddenly learnt so much and what I'd missed. Turned out she could now identify the difference between the Chemistry and Biology textbooks my cousin had. "C-H-E-M...istry. Correct aaa?" she'd ask. "Bi-law-gy. Uh?" She was definitely not someone you could define as matriarchal. The best fit would be 'paavam'. She had neither supra intelligence nor power to make an entire family obey her orders. She was rather the docile person who ended up being the wife of one of four brother and the willing obeyer of the family matriarch. Life wasn't kind to her really while she was younger. By the time she was was almost 70, one of her two daughters lost her husband to cancer and the other, to divorce. She worried the most about my mother and I, much to the irritation of others because they believed that she prayed for and wished well for *only* for us. To the mother that she was, she saw her son and her eldest daughter employed in regular jobs, and draw a salary, whatever it may be. She never understood the concept of her other daughter's work with Music/research/documentation and she would pray that her daughter be 'settled' financially. I loved my paati more than my thatha when I was 10 or 11. I grew to love and admire thatha much later. I was alleged to be their favorite grandchild. I fell sick the most. I was in and out of hospitals for a good while when I was a child and she worried about me a lot. I had a song taught to me in school and I came back and sang it to her. She dutifully took down the lyrics and learnt it from me and sang it as best as she could. Thiruve en illam varuvaaye... She had a battered book where she wrote down stuff like this. She also had a pretty bad handwriting. But she taught me to read and write Tamil and made me transition from Marathi to Tamil. Paatti had limited desires. At least she never told me what she wanted to eat or what she liked to eat. Or perhaps she did and I don't remember now. I didnt know where she liked to go. Nothing. But what she did like the most in the world, was the aaranji mitttai as she said it. The orange candy that one would get for probably 10 paise when I was in kindergarten. If someone asked her what she wanted, she'd say "aaranji mittaai". If my mom bought her a box of Fox candies, she'd remove every other color and keep only the orange. She said this was what she loved the most and the one sweet she could truly enjoy without teeth. I don't know why she never wore dentures though. A couple of days ago, I realized that my favorite, in spite of all the types of frozen yoghurts, ice creams and etc that is available today, is the orange popsicle that we used to get for 5/- but now costs 10 or 15/- depending on where we buy it from. I go on a good 10-20 km cycling expedition each day and a lot of time I go searching for the orange pop. It struck me then that I have probably carried her love for something aaranji too :) No other ice-cream, even the one that I churn myself at home gives me as much joy as the orange pop. It is sad I could not see for the one last time. Neither could my aunt, cousins or my mother or other relatives, so I actually have a lot of company in that misery. I remember her from the last conversation that we had. A video of her that I recorded on Sony Ericsson P900 that I still hold to because I couldn't download the video from the phone. And every time I go searching for the 10/- orange pop over the fancier stuff, I can't help but remember her toothless grin and her love for the aaranji mittaai. I wish she were here to see that we are well off today. Perhaps she knows.... my paati. Alamelu alias Jayalakshmi. This post has struck a chord in me as I too have my paati's who are 92 years old and 88 years old (paternal and maternal) and toothless. This post brought back some nostalgic memories of us sitting around our paatis and getting food delivered in our hand while she narrated stories. There was this story named "Attaribatcha" which we have made her recount innumerable times and every time she has obliged without fuss and every time it has the same cute ring to it when she says "Attaribatcha". Amazing were those days and somewhat sad to see that most of this generation is missing out on such fun. A very beautifully written post. You bike 10-20km everyday? Out on the roads? That's awesome! This brought back the memories. I have grand parents who are strong at heart and grew their children alone. Lot to learn from them. 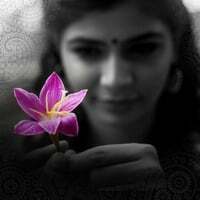 Beautiful Chinmayi..
Nostalgic post! Reminded me of my paatti (maternal) who was similar to yours because she too did not want to die a sumangali because no one could take care of my demanding grandpa. She would also feed us food in our palms when we all sat in a big circle - uncles, aunts, cousins etc. Precious paattis!! This post is BEAUTIFULLY written, Chinmayi. I truly love this post. The intimate love for your grandmother is so awesome and your grand mother too. I have experienced the same love in my life too. Your regular blogging habit is awesome. Hey hi Chinmayi! Your post made me reminisce about my grandparents! Miss them.. I have similar memories of my patti too. But you made me live yours with ur writing above. You are a great writer akka!